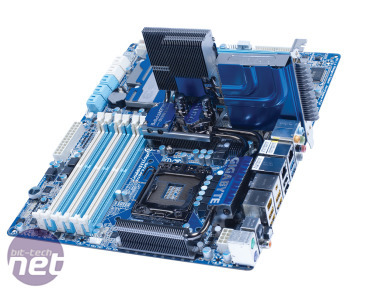 Like Asus and MSI, Gigabyte originally produced a huge range of X58 motherboards, but has since trimmed down the range to a few key models. 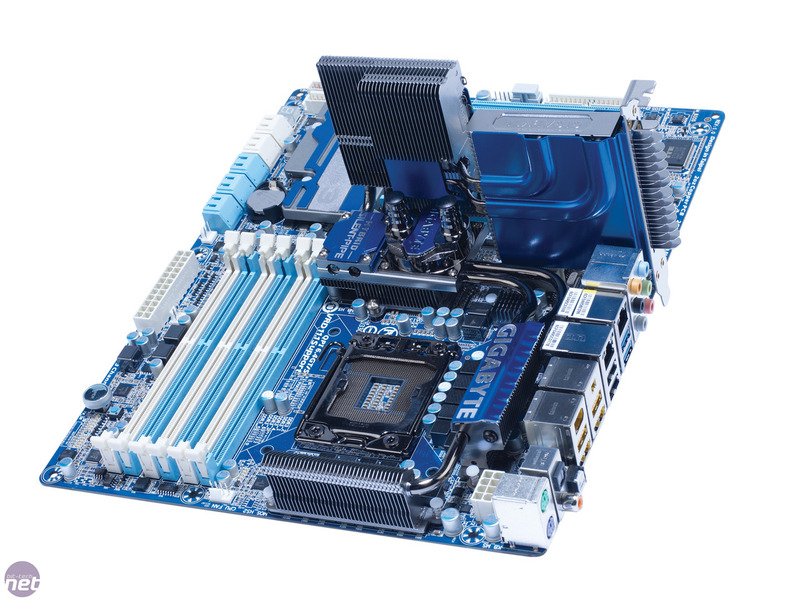 The GA-X58A-UD7 is at the top of the range, both in terms of specification and price. For starters, the GA-X58A-UD7 supports both SATA 6Gbps drives and USB 3 peripherals, so it’s as future-proof as it can possibly be. 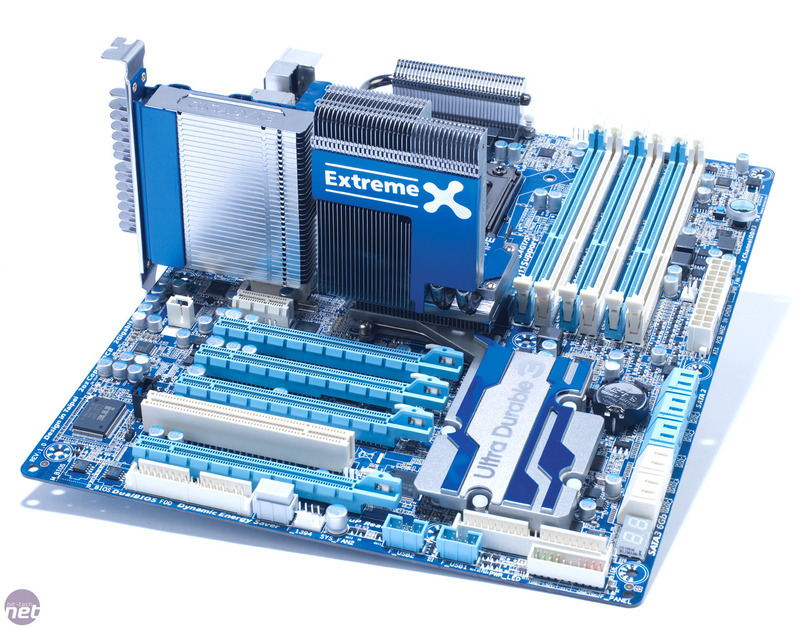 This isn’t enough for Gigabyte, though, as the GA-X58A-UD7 is crammed with other features. As well as two RAID-capable SATA 6Gbps ports powered by the Marvell 9128 controller, for example, there are three other SATA controllers powering a further eight RAID-capable SATA 3Gbps ports and two RAID-capable eSATA ports. Fortunately, despite our initial concern, this doesn’t mean that the GA-X58A-UD7 takes an age to boot without RAID enabled on the controllers. What’s more, although it has only two USB 3 ports, you’ll still find ten USB 2 ports and three FireWire ports dotted around the rear panel and PCB on headers. 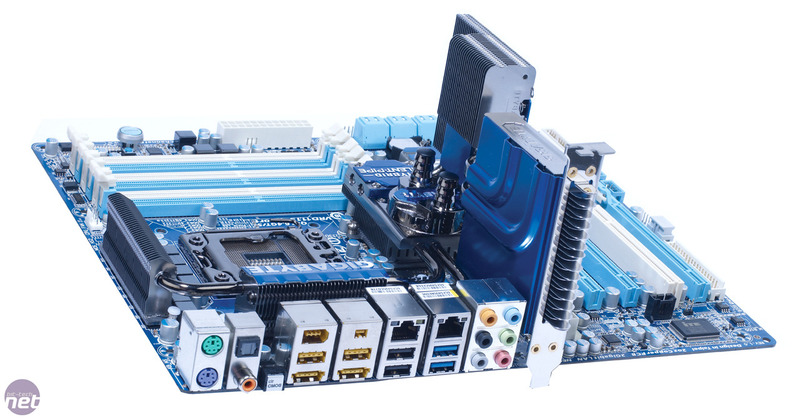 As it’s a full-sized ATX board, the GA-X58A-UD7 has six expansion slots – four 16x PCI-E, one 1x PCI-E and one PCI. 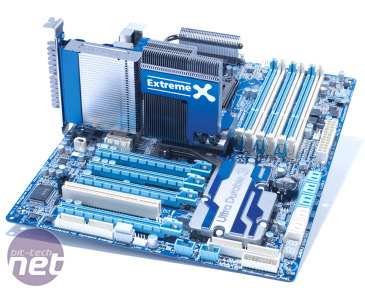 Gigabyte claims that the first and third 16x PCI-E slots always run at 16x, but slots two and four will only run at 8x each. However, we have doubts that the lanes are divvied up this way, as the X58 chipset has 36 rather than 48 lanes. Still, if it floats your boat, the GA-X58A-UD7 is certified for SLI, 3-way SLI and CrossFire. 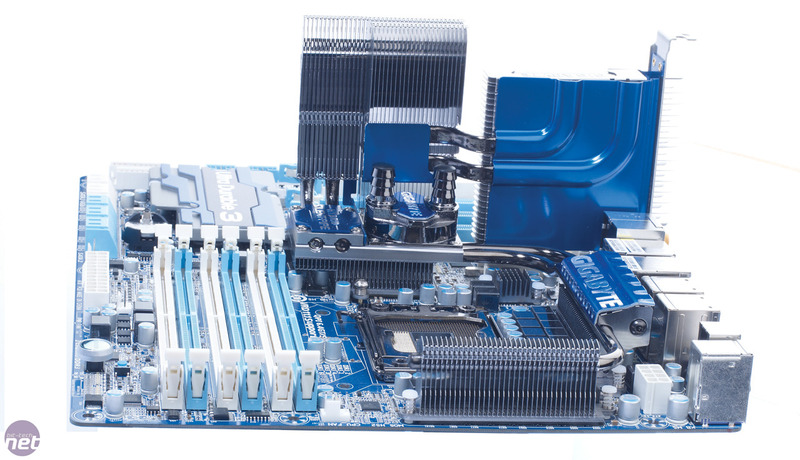 The chipset, Southbridge and VRMs are cooled by separate heatsinks linked by a series of heatpipes. A key feature of the GA-X58A-UD7 is an optional waterblock that sits on top of the chipset heatsink, although there’s so little contact area between it and the heatsink beneath that we aren’t convinced that it will work very well. As such, it’s more of a gimmick than a genuinely useful inclusion. 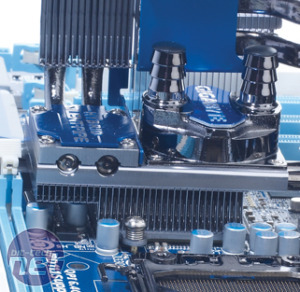 Also included is an additional cluster of heatsinks and heatpipes that can be screwed onto the top of the chipset heatsink. However, it’s such a convoluted design that it barely performs any useful function. When we removed it, we found that the chipset temperature barely increased at all. On a more positive note, the PCB layout is very good, with all the major components nicely separated. 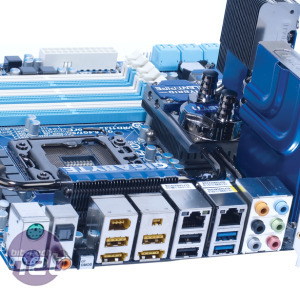 There are other pleasing touches too, such as all the SATA ports being mounted parallel with the PCB for neat cabling, a two-digit POST code display and six fan headers.